USAN is committed to maintaining Niagara Falls as a world-class tourism hub and gateway to New York State. With the construction of best-in-class accommodation amenities, we are making it easier for the region to showcase its beauty to visitors from all ends of the globe. These projects help to fulfill the need for additional quality downtown lodging, create new jobs and contribute to the overall beautification and usability of the area. 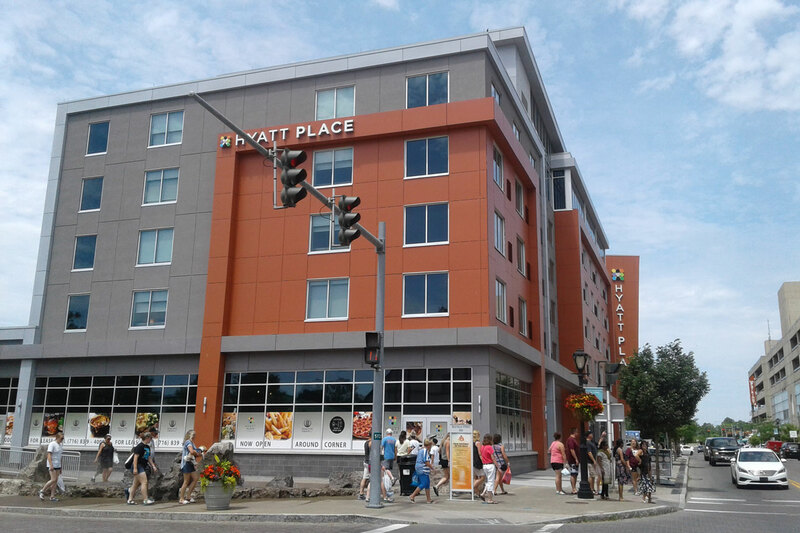 The $35 million Hyatt Place Hotel in Niagara Falls opened its doors in 2018. 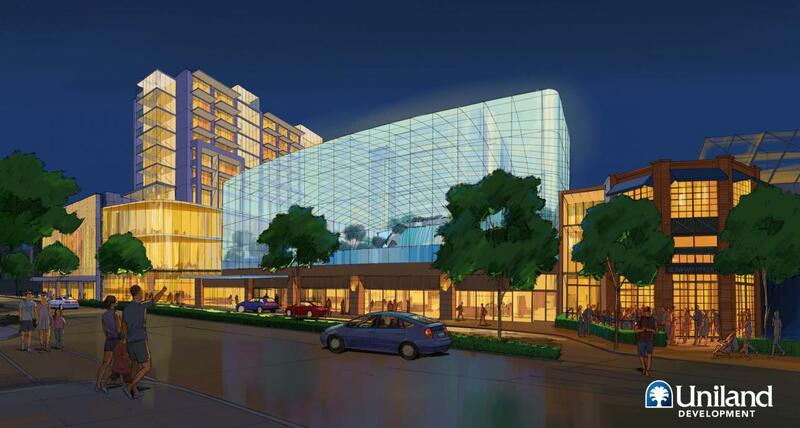 The more than 111,000 square feet, 128-room hotel is the first non-casino new development of this scale in more than 40 years in downtown Niagara Falls. The six-story hotel includes 14,500 square feet of meeting and banquet space, including nearly 7,000 square feet of retail space facing Old Falls Street. Hamister Group, LLC was the developer of the mixed-use hotel. The project was financed by Goldman Sachs Group, Inc. Empire State Development/USAN contributed a total of $4.85 million, including $2.1 million in Buffalo Billion (Phase 1) funds towards construction. Read more here. 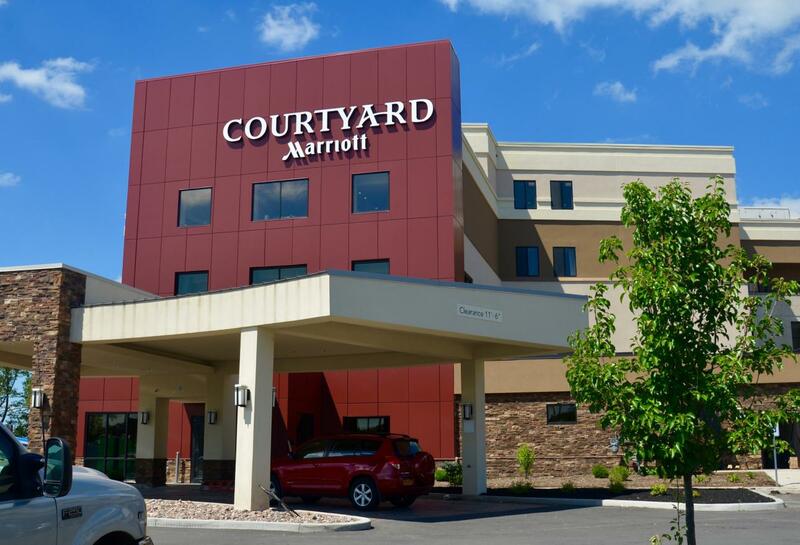 The $12.8 million Courtyard by Marriott® Hotel which opened in August 2017, is an adaptive reuse project which converted the vacant, 69,700-square-foot former Moore Business Forms office building into an 82-room hotel. Located on 900 Buffalo Avenue in Niagara Falls, the project includes more than 4,700-square-feet of retail space, consisting of a home theatre lounge, a 24/7 Grab-n-go Market, a Marriott Bistro with limited Starbucks service, and a public outdoor lounge and dining area. USAN approved a $1.25 million grant to developer Indian Ocean, LLC for the project. Read more here. The $37 million DoubleTree Hotel by Hilton, which opened in late December 2016, is the first upscale-grade Hilton property ever in Niagara Falls. The project included the demolition of a portion of the former Fallside Hotel and Conference Center, along with the renovation of a four-story section of the building that connects to a newly constructed nine-story tower. The 192-room hotel boasts 16,000 square feet of meeting and banquet facilities. The full service steakhouse, Parkway Prime, has an outdoor patio area facing the Niagara River. 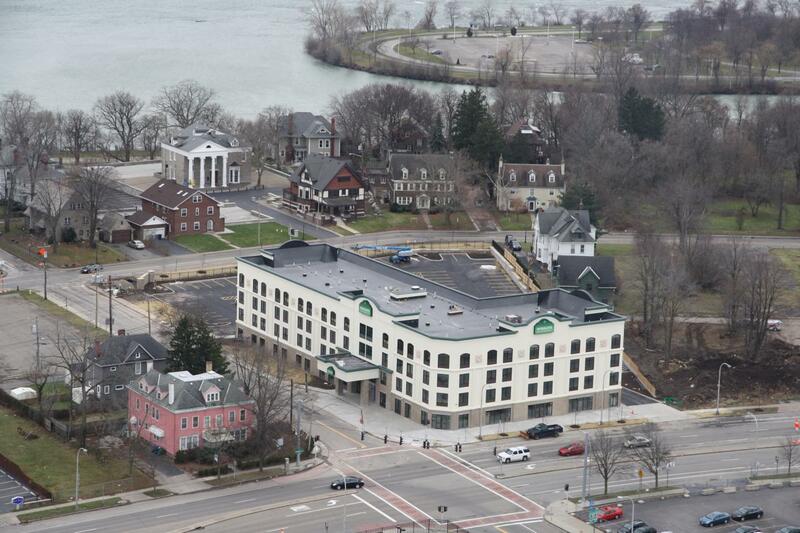 Merani Hotel Group received a $2 million convertible loan from Empire State Development’s Upstate Regional Blueprint Fund and a $750,000 capital grant from USAN. Read more here. 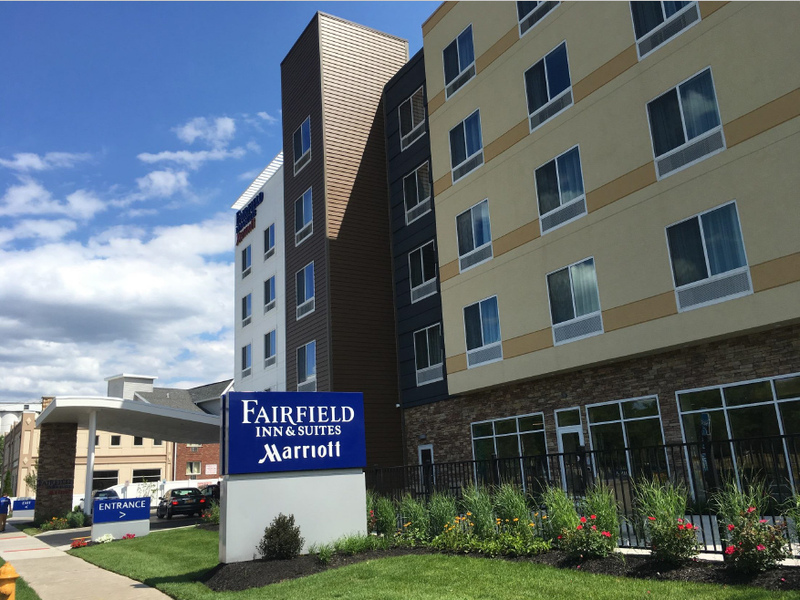 The $7 million Fairfield Inn & Suites hotel, which opened in June 2016, sits on a formerly vacant parcel in the heart of the city’s downtown tourist district. Sai Lodging developed the 46,000 square feet, 76-room hotel, which is the first Marriott-branded property in downtown Niagara Falls, NY. USAN provided a $125,000 grant for reimbursement of a portion of the capital improvement costs. Read more here. The $10.2 million Wingate by Wyndham Hotel, which opened in May 2015, is a 110-room hotel built by Plati Niagara Inc. Its 65,000 square feet features 4,000 square feet of retail space along Rainbow Boulevard. The hotel also includes an indoor pool, meeting space, fitness center, and complimentary hot breakfast. Plati Niagara accepted a $980,000 incentive proposal from USAN. Read more here. 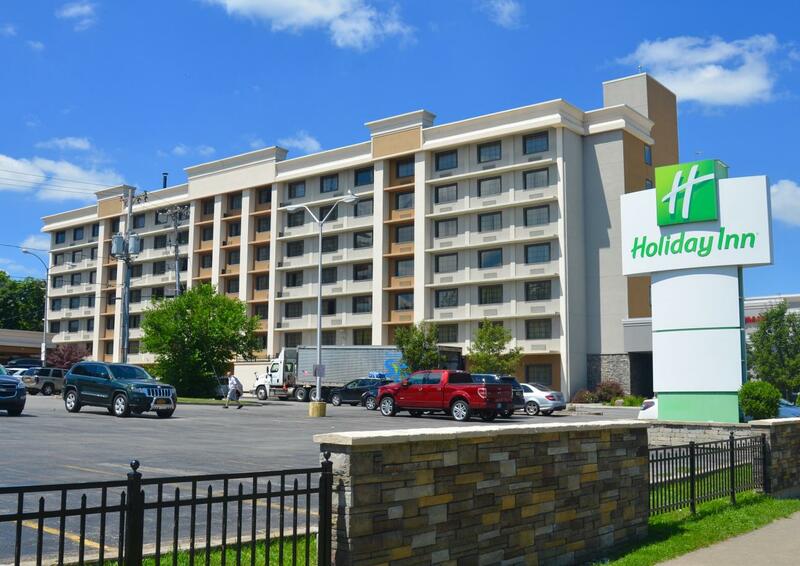 The $3.8 million upgrade and expansion of the Holiday Inn hotel was completed in July 2015. The 189-room major hotel complex on Buffalo Avenue includes interior and site upgrades, as well as the addition of a new retail wing fronting on Rainbow Boulevard near Centennial Circle. The retail wing features a Tony Roma’s® restaurant and a two-story family entertainment center branded under the name The Great American Arcade. Merani Holdings LLC accepted a $550,000 Capital Grant from Empire State Development and the N.F.C. Development Corporation, the banking arm of the City of Niagara Falls, also provided a $550,000 capital grant for a total award of $1.1 million. This project creates more than 50 new restaurant and retail jobs. Read more here. Completed in 2006, this $34 million hotel investment project revitalized a 400-room hotel property (at that time a Holiday Inn Select) into a Crowne Plaza Hotel. Project costs of $8 million in substantial upgrades included deluxe guestroom improvements, renovated lobby and arrival space, a lifestyle and retail center, spa, restaurant/pub and banquet space. USAN and Empire State Development invested $6 million in funding toward the project. The hotel offers new retail and dining including the City’s first Starbucks® Coffee shop located on the corner of Third and Old Falls Street. 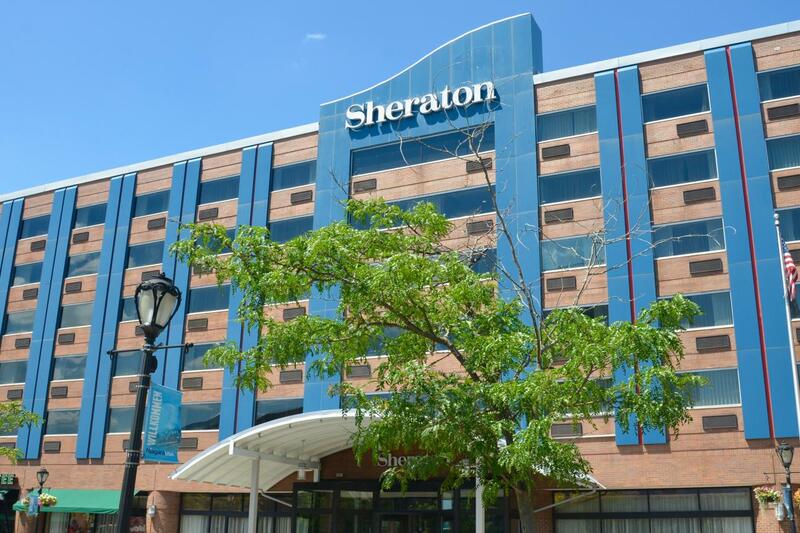 In March 2011, a new owner upgraded the hotel flag to a Sheraton® Hotel and established additional street-level food and beverage uses in the hotel, including a T.G.I. Friday’s® restaurant and later in 2015, a Rainforest Cafe®. The former United Office Building reclaimed its rightful place as a downtown Niagara Falls landmark in 2008. Now known as the Giacomo Hotel and Residences, it is the premiere luxury boutique hotel in Niagara Falls. The 20-story Giacomo features 38 rooms and a residential component hosting 24 apartments with complete access to the hotel’s amenities. Designed by the prominent firm of Esenwein and Johnson and completed in 1929, the building is a distinctive example of the Mayan Revival style and is listed on the State and National Registers of Historic Places. An example of a successful public-private partnership, after USAN invested $845,000 to clear option on title, First Street Group, LLC, an affiliate of Buffalo-based Ellicott Development Company, invested approximately $10 million into a comprehensive restoration plan which returned the building to its original grandeur. 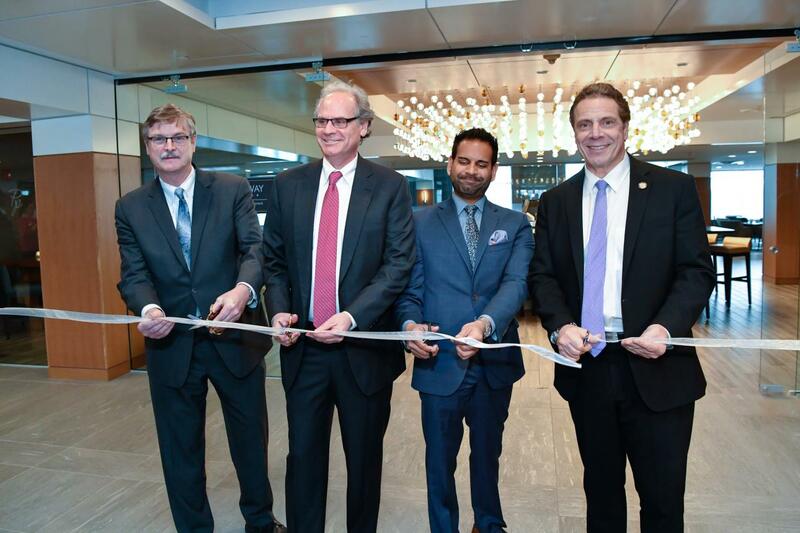 On July 18, 2017, Governor Andrew M. Cuomo announced Brine Wells Development LLC as the preferred developer for the restoration of the historic Hotel Niagara. The Hotel Niagara is the oldest standing hotel in Niagara Falls and retains much of the architectural integrity that once made it an iconic piece of the city's skyline. The approximately $42 million project will transform the property into a full-service, 130-room upscale hotel with restaurants, lounges and banquet facilities. The property is expected to re-open in spring 2019. 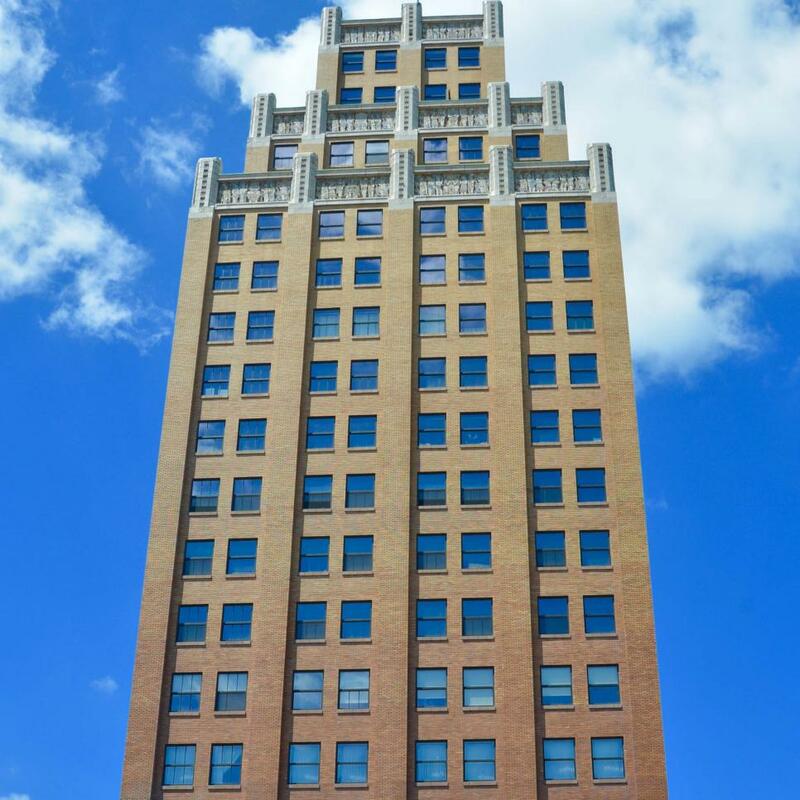 Built in 1924, the 12-story Hotel Niagara is now listed on the National Register of Historic Places. 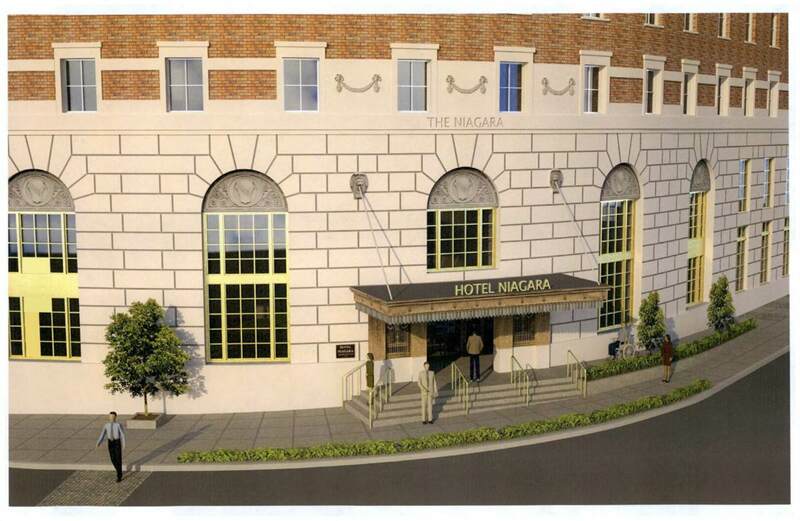 The Hotel Niagara property was acquired by USAN in July 2016 with $4.4 million in Buffalo Billion funds to facilitate its restoration and reuse. The project includes the sale of the Hotel Niagara property to Brine Wells for one dollar, and the company will then invest approximately $42 million into transforming the site. To support the project and ensure it moves forward, the developer is expected to seek a grant of up to $3.5 million, subject to approval by the USAN Board of Directors. Read more here. The redevelopment of the remaining 200,000 square feet of the former Rainbow Centre Mall is the next step in the transformation of downtown Niagara Falls. The proposed Wonder Falls Resort project will be a locally-themed entertainment complex involving an indoor waterpark highlighting natural features in the region; a new hotel tower with rooftop dining; a Daredevil Adventure Center, an indoor family amusement facility; and various other retail and food and beverage venues. Uniland Development Company was chosen as the preferred developer for the project. Read more here.